April 2018 | Fairway Green Inc. When will my lawn green up? This picture illustrates how a Fine Fescue grass (right) greens up differently than a Blue/Rye grass mix (left). 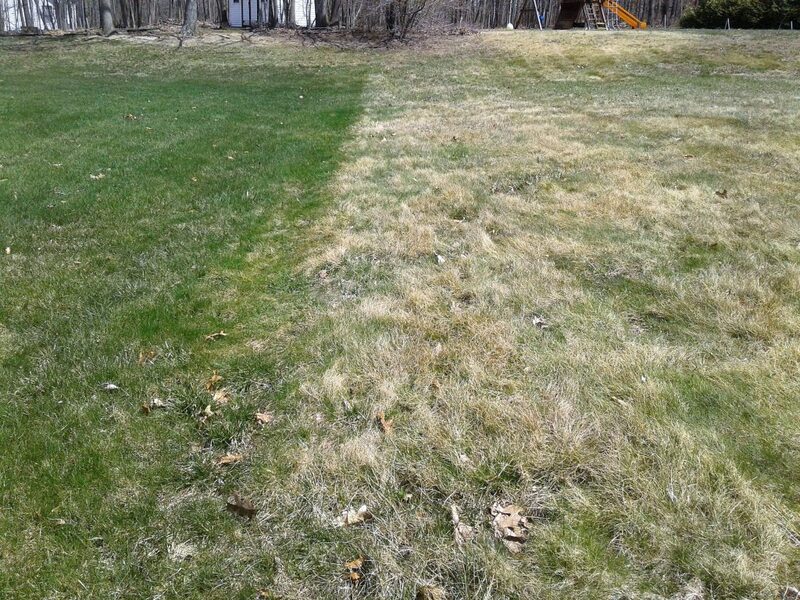 In the spring, many lawns are brown and still in their winter dormancy state. They will eventually green up, but timing depends on some external factors. Your lawn’s green up in the spring is dictated by the temperatures of the soil as well as grass type. The temperature of the soil needs to reach 50 to 65 degrees to actively start the growing and green-up process for northern grasses in our area including rye, blue and fescues. To further complicate things, different species of grasses green up at different soil temperatures. Thicker lawns can take a little longer to green up because the sunlight is not directly getting to the soil, hence taking more time for the soil to reach the desired green-up temperatures. Also, if you have a lot of tree cover or other shade issues, the soil may take a little longer to warm up, delaying your lawn’s green up. You can’t control the external factors but there are a few things you can do to help your lawn green up a little quicker next spring. 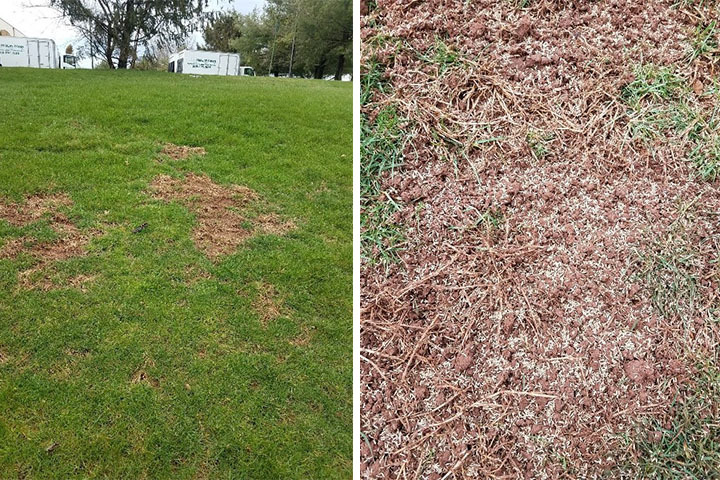 What can be done to help the green up process in the spring? The most important thing you can do to help your lawn green up in the spring is starting to think about it in the fall. Specifically, a winterizing fertilizer applied late in the fall season will improve the green up process the following spring. 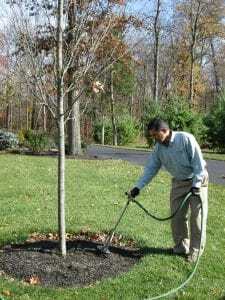 The winterizing fertilizer is one of the most important applications for your lawn. It will provide nutrients that help promote root growth and get stored as reserves over the winter. The stored nutrients will be used for new growth and aid with your lawn greening up during the spring. Once your lawn greens up in the spring you are going to want to keep it that way for the rest of the season. Here are some helpful tips to keep your lawn green all season long especially during the hot and stressful summer months. Water the lawn regularly. Your lawn should receive roughly 1 inch of water per week. It is recommended to start running underground sprinklers for 1 to 1 ½ hours per zone, twice a week. As for hose-end sprinklers start at around 4 hours per zone, once a week. If the lawn loses color add more time to your watering schedule not more days. Bump up your watering schedule by half-hour increments weekly until the color is adequate. Watering should occur between midnight and 6 a.m. Watering your lawn at night while you are sleeping will help to minimize the length of time the lawn is wet which will reduce disease activity. It will also help save you money. At night there is no sun to evaporate the water and you will use a lot less water to achieve your watering goals. For hose-end sprinklers, you can go to any home improvement store and purchase battery operated timers and splitters for the hoses to set up in your lawn for overnight watering. Once the hot summer months roll around, the lawn will be under a tremendous amount of stress. If the lawn does not get enough water it will turn brown and go into summer dormancy. Once the lawn turns brown from summer stress it will take heavy watering for to green back up. The secret to having a green lawn all summer long is to water on a regular schedule and keep to that schedule. Mow the lawn correctly. The taller grass blades will shade the soil underneath keeping the soil moist longer. Mow the lawn when it needs to be mowed (not because you mow every Wednesday). Mow off 1/3 of the grass blade at a time. Keep the height of cut to 3 – 3 ½ inches in length, and change the direction of the mowing pattern with each mowing. This will help to reduce bending of the grass blade in the same direction and reduce ruts by the tires of the mower. Keep the mower blades sharp to avoid shredding the leaf tips, which can cause infection of disease and the weakening of the grass plants in general. Core aerate your lawn annually in the fall. Core aeration is the mechanical process of removing plugs of soil creating small holes in the lawn which allows air, water and nutrients to get down to the grass root zone. This process also helps the grass roots grow deeper and produce a stronger, more vigorously growing lawn. To watch a video and learn more information about core aeration, check out our blog. Apply lime. Lime will help to regulate the pH of the soil. When the pH of the soil is low the nutrients in the soil are not completely available for use by the grass plants. If the pH is in the optimum range (between 6.3 – 6.5 for grasses in our area) the lawn can utilize the nutrients to its full capacity which will help create a healthy and stronger lawn. For more information about soil pH and lime, check out our blog. Fertilize your lawn regularly throughout the season. By maintaining a good fertilizer program, you are supplying your turf with vital nutrients (like Nitrogen which helps maintain the color of the grass plants) it requires for optimum health, growth and color. Bottom line, be patient, there is nothing wrong if your lawn greens up later than your neighbor’s. It will green up over time, but keeping it green throughout the season, now that’s the real trick to a beautiful colorful lawn. If you have any questions about lawn services that can help the lawn green up throughout the year, check out our platinum lawn program. If you are in our service areas and have questions, please feel free to give our office a call at 908-281-7888. The season of new life in our lawns and landscapes has finally arrived! Early in the spring, trees and shrubs produce beautiful flowers that bring vibrant colors to the landscapes, but unfortunately this time of year also brings unwanted plants; also known as weeds. Below we will go through the most common early spring weeds and the best treatment methods. Dandelions are easily the most infamous of the early spring weeds that are very easy to identify. We’ve all driven by a beautiful green landscape freckled with dandelions, disrupting the look of a lawn that recently greened up from winter dormancy. Dandelions are a perennial plant with leaves between 3-10 inches in length, stemming from a singular taproot. The yellow flower will transform into the white “puff ball” that we all used to pick up and blow on when we were kids. This part of the flowering weed is the seed head. Often, the seeds are carried by wind to a new destination and germinates to form a new dandelion plant the following year. Hairy bittercress is another common early spring weed that sticks out like a sore thumb in the lawn. This early spring weed is an annual plant that starts to grow in early winter and matures through the very early part of the spring season. It produces a white flower, that is easily identifiable among the rest of the green plant. 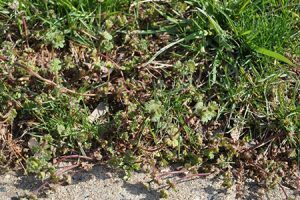 Many homeowners observe the presence of this weed despite having a lawn treatment service because this weed develops during the winter and most lawn companies have stopped treating weeds for the season. Unfortunately, its presence in the lawn is almost unavoidable. Wild onion and wild garlic are perennial plants that grow from bulbs in the soil. These are the tallest of the early spring weeds that are sure to stand out on any home lawn. Both plants have thin green waxy leaves; however wild garlic are round and hollow leaves, while wild onion leaves are flat and solid. 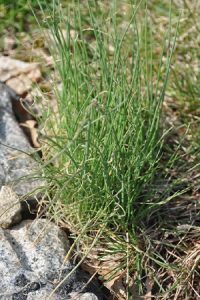 The bulbs of the wild onion and garlic plan can remain dormant in the soil for several years, making the control for these weeds sometimes difficult. They look very similar to scallions you purchase in the store, except smaller. 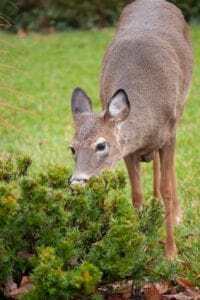 Additionally, deer will not eat these weeds, and your dogs and cats should stay away from these plants as these early spring weeds are poisonous to them. 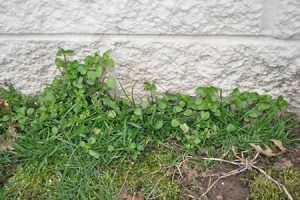 An early spring annual plant, chickweed typically will grow along edges of beds, sidewalks and curbs as seen in the image below. Chickweed grows in low lying patches as it roots itself from nodes along its stems. It can develop a white flower if soil temperatures become warm enough before the lawn is being mowed regularly. The difference between the mouse-ear variety and common chickweed is that the leaves of mouse-ear chickweed are hair covered and appear fuzzy upon close inspection. This early spring weed is an annual plant with circular to heart shaped leaves and square stems that have a green to purple color to them. The flower of henbit grows in whorls around the stem and are a pink to purple in color. Henbit usually resides in the harshest of environments near foundations, in stone, and very compacted soil. Although there are numerous types of early spring weeds, controlling them is not very difficult with the right product. A treatment with the appropriate broadleaf weed control should kill most of the visible weeds this year. Unfortunately, broadleaf weed control does not act as a preventative, so you will need to apply follow up treatments as more weeds emerge. When selecting weed control, make sure you read the label to confirm the product will control the type of weeds growing in your lawn. In addition, be sure to follow all instructions for proper use and rates to avoid any adverse effects. Please make sure you do not apply a non-selective herbicide to your turf, such as Round Up containing Glyphosate, this will not only kill the spring weeds but also any grass plants that it contacts as well. For information on cultural practices that can help prepare your lawn and landscape ready for outdoor parties and get togethers this spring, check out our spring maintenance blog. 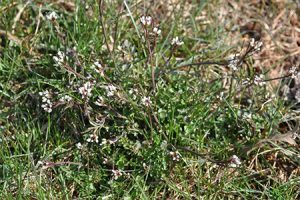 Although it’s practically impossible to avoid having these weeds enter your lawn, these common early spring weeds are easy to control. 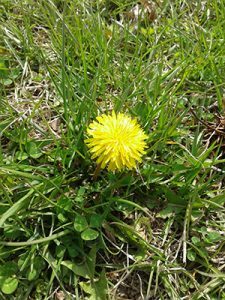 If you have a lawn care company already, control of these early spring weeds should be included as part of your basic program. If you’re a do it yourselfer, getting rid of these early spring weeds can be accomplished using over the counter herbicides. Just be sure to read and follow all label instructions. To be ready for the common summer broadleaf weeds, check out our blog. If you have any questions and are in our service area, please give our office a call at 908-281-7888. Among a host of other long-awaited chores, many homeowners are eager to get out onto their lawns once the snow has melted and plant grass in the spring. While it may be difficult to contain the urge to rush out to the local home improvement store and spend hundreds of dollars in a state of euphoria brought on by the smell of fresh cut grass, there are a few things to consider first before planting grass in the spring. The first thing to consider before planting grass in the spring is whether or not the lawn needs to be seeded at all. In the early months of spring the soil is often super saturated from the snow melt. A lot of the plants are overly succulent with no rigidity and the color is poor because a lot of plants are still dormant. Keep in mind that the lawn has just started to wake up and isn’t looking its best. I mean, would you want anyone making any decisions regarding what to do about your overall appeal right after you rolled out of bed? Just try not to be overly disappointed with the lawn’s appearance at first sight and know that it looks as bad as it is going to early in spring before the soil temperatures become warm enough to trigger spring growth before you decide to plant grass in the spring. How should one determine if you should plant grass in the spring? Spring seeding should be planned if there any obvious areas of exposed soil. These areas can represent a large percentage of the property, or be as small as a baseball or basketball. Even small areas of exposed soil where there is little to no grass present can be an eyesore, and establishing new grass in these areas before they become worse through erosion is important. Once the decision is made to plant grass in the spring, the work should be done as early as the weather permits. The best time to plant grass in the spring is when the snow has melted and it appears that there will be no future snow accumulation. This is usually between late March and early April. The timing is important because it is essential that the new seed has as many weeks as possible to establish before the summer arrives. One of the biggest disadvantages to seeding any areas in the spring is that a large percentage of the new plants do not develop a root system mature enough to survive the stress of summer. Therefore, it is best only to address the sections of the lawn that absolutely need it in spring. The above pictures show a portion of a lawn that needs to be seeded, and what it looks like post seeding. After the seeding has taken place it is important to feed the young plants. If you have a lawn care service in place they should be notified. Explain to them when and where on the property you have planted grass in the spring. The service provider can then be sure to avoid the application of any herbicides to the areas, and to bring out starter fertilizer with the next scheduled treatment to apply on the new grass. Keeping new grass properly fed with starter fertilizer high in phosphorus is critical in trying to ensure that the young plants establish in time for summer. Skipping the Early Spring application of fertilizer for fear that it may damage the turf in some way is a huge mistake often made by homeowners. Like any other newborn, young seedlings need to feed immediately to grow, and like infants they require a special diet different than that of mature adults. With the new seed planted and fertilized, it becomes about monitoring the seedlings as they come in. The areas need to be kept moist always. One of the advantages of planting grass in the spring is that there is frequent rainfall, so keeping seeded areas moist is not very difficult. Light, frequent watering is best. New plants do not have roots, so deep watering does not serve much of a purpose. Traffic of the areas should be kept to a bare minimum. Use stakes and some string or caution tape to keep anyone from entering the area unnecessarily. The areas will need to be mowed eventually, but that should not happen until the new plants reach a height of about 4” or so. If these instructions are followed to the letter, the new grass will have been given the best chance to germinate and establish. However, there are additional issues that come with planting grass in the spring that may adversely affect the result despite the best efforts of the homeowner. First, as mentioned already the trick with planting grass in the spring is to get it to establish before the summer arrives. Sometimes though, summer arrives earlier than expected. It is not unheard of for there to be heat waves as early as May, and it won’t take much to damage the young plants. Just a single week of temperatures more than eighty degrees may be enough to cause injury from which the new grass will not be able to recover. Second, the race for the new grass to establish is not just against the heat, but also the broadleaf weed growth. In areas of the lawn where there is less grass established there is more soil exposed to direct sunlight. The temperature increase in the soil, along with the lack of plant competition, creates the perfect environment for excessive broadleaf weed growth. If broadleaf weeds establish in these areas before the new grass does, then the results may be less than desirable. The last factor to consider before deciding to plant grass in the spring is crabgrass. The most effective way to control crabgrass is preventatively with treatments that are applied in the early spring. Any areas seeded cannot be receive this treatment because it prevents the new grass from being able to establish. What this means is that any areas seeded will most likely have to contend with a good deal of crabgrass growth. And because crabgrass growth doesn’t really occur until June, even new seed that looks amazing to that point can suddenly become lackluster once the crabgrass populates the area. The crabgrass can be treated at that point, but then the homeowner is left with an area filled with dead crabgrass plants until the lawn can be reseeded at summer’s end. While spring is the time for new growth, all the factors mentioned should be carefully considered before planting grass in the spring. In general, smaller touch up seeding is a non-issue and should be taken care of without much thought. However, before doing any extensive plantings of grass in the spring, it may be best to contact a lawn care professional and weigh the options carefully. For more information about preparing your lawn and landscape for spring, check out our blog that takes an in-depth look into preparing your property for the spring. If you are in our service area and have any questions about planting grass in the spring, please don’t hesitate to call us at 908-281-7888.